I recently shared with you guys my goal to stop washing my hair everyday. It’s doing more damage than actually making my hair look good. The dry shampoos I’ve tried haven’t cut it and led me to the continued routine of washing my hair constantly. I got the opportunity to try Batiste’s Dry Shampoo and I have to say, I’ve fallen in love. It’s been three days now and I have not washed my hair. Which is amazing since I have really fine oily hair that starts to look oily the day after its been washed. I’ve had work, finals at school, and attended the gym and my hair still looks great. (Tip: When headed to the gym apply the dry shampoo before starting your work out as well as afterwards). It’s really simple to use. Just spray your roots a couple inches away. Let it dry, brush it out, and style your hair as usual. Talk about a quick morning routine. Batiste Dry Shampoo is affordable and worth it at only $7.99 for the full size and $3.99 for the “on the go” travel size. Whether you use the Original scent or Blush (which smells great, like perfume for your hair), you won’t be disappointed with the results. I’ve been guilty of it for years. Not weeks, or months, but years. I’m one of those people who wash their hair everyday. It’s sort of like a Catch 22 for me. I want my hair to look shiny and healthy everyday; yet washing it constantly is doing the opposite. For those of us with fine hair, it can get pretty annoying when your hair gets dirty so quickly. Washing your hair everyday strips it of the naturals oils it creates and needs to moisturize your scalp. Some create the oils quicker than others. I’ve always been skeptical of it, but there are dry shampoos you can use. Dry shampoo looks like a hair spray can usually, and you spray your roots. It’s supposed to help decrease the amount of oils, helping you keep a cleaner scalp longer. Different companies sell them. Bumble&Bumble has a popular one. 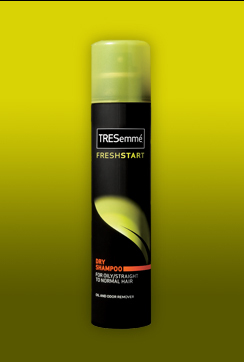 Tresemme now offers dry shampoo and a mousse. The mouse if for thicker, curly hair. Since the spray form is more airy, it’s best for fine hair. A quickie you can try at home is powder. Sprinkle a bit of powder on your scalp and massage it. The powder soaks up the oils. When you do wash your hair make sure you’re massaging the shampoo on your scalp, because that is what’s lifts the oils off the root. Conditioner should only be applied to your ends and the bottom half of your hair. When all else fails, ACCESSORIZE. Throw on a cute headband or pull your hair back with a fabulous clip.